Nothing brings you closer to the great outdoors than a glazed extension. Call them what you want, conservatory, orangery, garden room or atrium, they’re quite simply, the most effective way of expanding your living space and enhancing the look and value of your home. Our conservatories can provide an inspirational space in which to relax, dine or entertain, one that is every bit as comfortable, stylish and well-appointed as the rest of your home. You will be living with your new space for years to come, so it’s well worth paying that little bit extra to have exactly what you want. 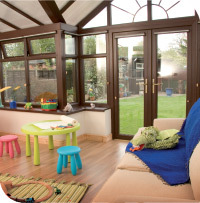 Our wide choice of finishes and flexible roof systems allow us to be entirely design led in meeting your needs. Part brick or fully glazed, contemporary or traditional, our bespoke glazed building cater for all tastes and styles. We have the systems and the know how to build your vision. Let your imagination run wild. or enquiries that you may have!